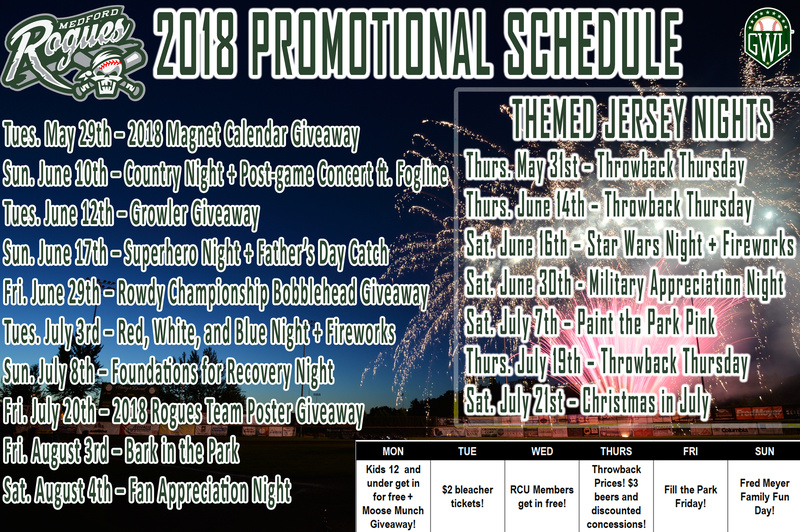 MEDFORD, Ore. – The 2017 Great West League Champion Medford Rogues have released their full Promotional Schedule for the 2018 season. The Rogues kickoff their defense of their 2017 GWL championship starting on May 29th with a three-game series against the Lincoln Potters at Harry & David Field. For more information about 2018 season tickets, all new Flex Packs, mini plans, and group tickets, please call 541-973-2883. To keep up with all the latest team news and information, like the Medford Rogues on Facebook and follow us @MedfordRogues on Twitter and Instagram.